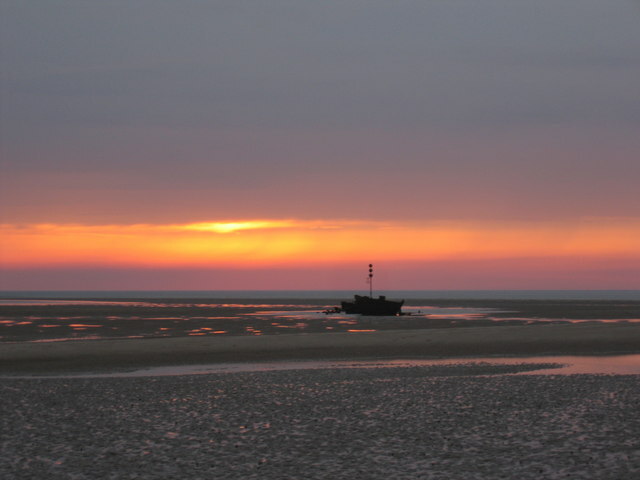 A photograph at sunset from the Far Point on Scolt Head Island showing the wreck of the SS Vina. The SS Vina was wrecked during the Second World War (1944?) whilst being towed into position for military target practice. The photograph was taken on 12th September 2006 at low-tide whilst surveying the spit features that constitute Far Point - the crest of one of these features can be seen in the foreground. © Copyright David Livingstone and licensed for reuse under this Creative Commons Licence. This page has been viewed about 2320 times. TF7846 : The Wreck (SS Vina) from Scolt Head Island SS Vina was built for and owned by my family's shipping company, J.T.Salvesen of Grangemouth. After my grandfather died in the mid-sixties, I remember the wood-mounted brass ship's bell arriving at my home from Scotland. It lived in our hall. Sadly, I have no idea what became of it after my parents moved house many years later.